This arithmetic sequence calculator (also called the arithmetic series calculator) is a handy tool for analyzing a sequence of numbers that is created by adding a constant value each time. You can use it to find any property of the sequence - the first term, common difference, nᵗʰ term, or the sum of the first n terms. You can dive straight into using it or read on to discover how it works. In this article, we explain the arithmetic sequence definition, clarify the sequence equation that the calculator uses, and hand you the formula for finding arithmetic series (sum of an arithmetic progression). We also provide an overview of the differences between arithmetic and geometric sequences and an easy-to-understand example of the application of our tool. To answer this question, you first need to know what the term sequence means. By definition, a sequence in mathematics is a collection of objects, such as numbers or letters, that come in a specific order. These objects are called elements or terms of the sequence. It is quite common for the same object to appear multiple times in one sequence. An arithmetic sequence is also a set of objects - more specifically, of numbers. Each consecutive number is created by adding a constant number (called the common difference) to the previous one. Such a sequence can be finite when it has a determined number of terms (for example, 20), or infinite if we don't specify the number of terms. Each arithmetic sequence is uniquely defined by two coefficients: the common difference and the first term. If you know these two values, you are able to write down the whole sequence. Once you start diving into the topic of what is an arithmetic sequence, it's likely that you'll encounter some confusion. It happens because of various naming conventions that are in use. Two most common terms you might encounter are arithmetic sequence and series. The first one is also often called an arithmetic progression, while the second one is also named the partial sum. The main difference between sequence and series is that by definition, an arithmetic sequence is simply the set of numbers created by adding the common difference each time. Arithmetic series, on the other head, is the sum of n terms of a sequence. For example, you might denote the sum of the first 12 terms with S₁₂ = a₁ + a₂ + ... + a₁₂. Can you find the common difference of each of these sequences? Hint: try subtracting a term from the following term. Based on these examples of arithmetic sequences, you can observe that the common difference doesn't need to be a natural number - it could be a fraction. In fact, it doesn't even have to be positive! If the common difference of an arithmetic sequence is positive, we call it an increasing sequence. Naturally, if the difference is negative, the sequence will be decreasing. What happens in the case of zero difference? Well, you will obtain a monotone sequence, where each term is equal to the previous one. Can you deduce what is the common difference in this case? In fact, you shouldn't be able to. This is not an example of an arithmetic sequence, but a special case, called the Fibonacci sequence. Each term is found by adding up the two terms before it. A great application of the Fibonacci sequence is constructing a spiral. If you drew squares with sides of length equal to the consecutive terms of this sequence, you'd obtain a perfect spiral. A perfect spiral - just like this one! Let's assume you want to find the 30ᵗʰ term of any of the sequences mentioned above (except for the Fibonacci sequence, of course). Writing down the first 30 terms would be tedious and time-consuming. You probably noticed, though, that you don't have to write them all down! It's enough if you add 29 common differences to the first term. Let's generalize this statement to formulate the arithmetic sequence equation. It is the formula for any nᵗʰ term of the sequence. a₁ is the first term of the sequence. This arithmetic sequence formula is applicable in the case of all common differences, whether they're positive, negative, or equal to zero. Naturally, in the case of a zero difference, all terms are equal to each other, making any calculations unnecessary. 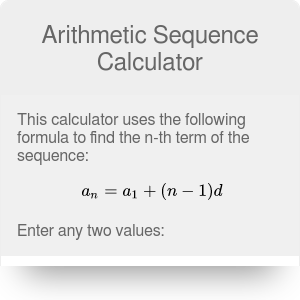 Our arithmetic sequence calculator can also find the sum of the sequence (called the arithmetic series) for you. Trust us, you can do it by yourself - it's not that hard! The sum of each pair is constant and equal to 24. That means that we don't have to add all numbers. All you have to do is to add the first and last term of the sequence and multiply that sum by the number of pairs (i.e., by n/2). This formula will allow you to find the sum of an arithmetic sequence. When looking for a sum of an arithmetic sequence, you have probably noticed that you need to pick the value of n in order to calculate the partial sum. What if you wanted to sum up all of the terms of the sequence? Intuitively, the sum of an infinite number of terms will be equal to infinity, whether the common difference is positive, negative, or even equal to zero. It is not the case for all types of sequences, though. If you pick another one, for example a geometric sequence, the sum to infinity might turn out to be a finite term. Obviously, our arithmetic sequence calculator is not able to analyze any other type of sequence. For example, the sequence 2, 4, 8, 16, 32... does not have a common difference. It's because it is a different kind of a sequence - a geometric progression. What is the main difference between an arithmetic and a geometric sequence? While N arithmetic one uses a common difference to construct each consecutive term, a geometric sequence uses a common ratio. It means that we multiply each term by a certain number every time we want to create a new term. One interesting example of a geometric sequence is the so-called digital universe. You probably heard that the amount of digital information is doubling in size every two years. It means that you can write the numbers representing the amount of data in a geometric sequence, with a common ratio equal to two. You can also analyze a special type of sequence, called the arithmetico-geometric sequence. It is created by multiplying the terms of two progressions - and arithmetic one and a geometric one. Such a sequence is defined by four parameters: the initial value of the arithmetic progression a, the common difference d, the initial value of geometric progression b, and the common ratio r.
Let's analyze a simple example that can be solved using the arithmetic sequence formula. We will take a close look at the example of free fall. A stone is falling freely down a deep shaft. During the first second, it travels four meters down. Every next second, the distance it falls is 9.8 meters longer. What is the distance traveled by the stone between the fifth and ninth second? The distance traveled follows an arithmetic progression with an initial value a = 4 m and a common difference d = 9.8 m.
During the first nine seconds, the stone travels a total of 388.8 m. However, we're only interested in the distance covered from the fifth until the ninth second. How to calculate this value? It's easy - all we have to do is subtract the distance traveled in the first four seconds, S₄, from the partial sum S₉. There is an alternative method to solving this example. You can use the arithmetic sequence formula to calculate the distance traveled in the fifth, sixth, seventh, eight and ninth second, and add these values together. Try to do it yourself - you will soon realize that the result is exactly the same! Arithmetic Sequence Calculator can be embedded on your website to enrich the content you wrote and make it easier for your visitors to understand your message.